Trendsetters from around the globe descended on Britain’s capital in the last few days for the bi-annual London Fashion Week, which sees a blend of long-established designers showcasing their latest sartorial output next to lesser-known up-and-coming talent. Highlights of London Fashion Week included several catwalk appearances from model of the moment Cara Delevigne, Vivienne Westwood wowing crowds with her Red Label collection and Rhianna modelling her new range for River Island. But London Fashion Week symbolises far more than perfect pouts and seams sashaying down the runway. As a representative of British business, it was and is incredibly important to the country, writes Jemimah Steinfeld. For one, it contributes heavily to the UK economy, which could do with an injection of fun – and funds – right now. With buyers from 39 different countries in attendance, and a further 5,000 visitors from around the world, the British Fashion Council estimates orders of more than 100 million pounds are placed during London Fashion Week each season. Providing Britain with a global platform to showcase its designs is incredibly important. On a more macro scale, the fashion industry is quoted to be worth £21 billion to the UK economy and supports 816,000 jobs, making it the largest employer of all the British creative industries. You need only visit Oxford Street on a Saturday afternoon to know that this is not an industry easily dismissed. British fashion is also symbolic of our country’s innovative spirit. Some of the biggest fashion movements have developed here, from miniskirts in the 1960s to Dr Martin boots in the 1990s. Speaking to Catherine Glover, a lecturer in the department of Fashion Communication at the University of Northumbria, she explains that heritage and craftsmanship are strong parts of our historic and contemporary fashion landscape and “continue to be defining characteristics for such globally respected brands as Burberry and Mulberry, along with providing great inspiration for under-graduate and post-graduate fashion students at the University of Northumbria”. For both students, London Fashion Week really represents the openness of the creative environment in the UK. 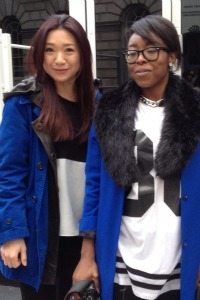 That these two students have come to study fashion in the UK from other corners of the globe is also significant. Britain’s willingness to embrace different cultures has contributed to the innovation and evolution of its fashion. Designs are imported as much as they are exported. “With our fashion capital, London, a home for such diverse cultural communities, the medium of street style becomes an exciting reflection of our multi-cultural society and provides an eccentric and ever-varying aesthetic showcase that is noted around the world,” comments Glover on this. British Fashion Council head Caroline Rush acknowledged this fact at London Fashion Week this year when she said that the cultural diversity of London gave it an “undeniable edge”. The excitement that British fashion generates was certainly palpable at Somerset House, the headquarters of London Fashion Week, upon visiting it last week. 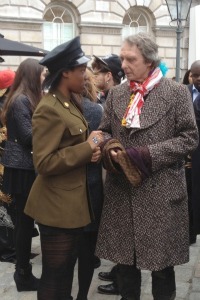 Off the catwalk and in the queue, people wore kimonos, African prints and military attire. It was a rich tapestry – colourful, hectic and a little bit crazy – and at its core it was very British.